In downtown Mawlamyine Capital of Mon State, a crowd of 200 gathered on March 14 to stage a protest against hydropower projects in conflict zones. Marking the International Day of Action for Rivers, the demonstrators called for the government to reassess building large-scale dams until the country’s armed conflict is resolved and the political system reformed. 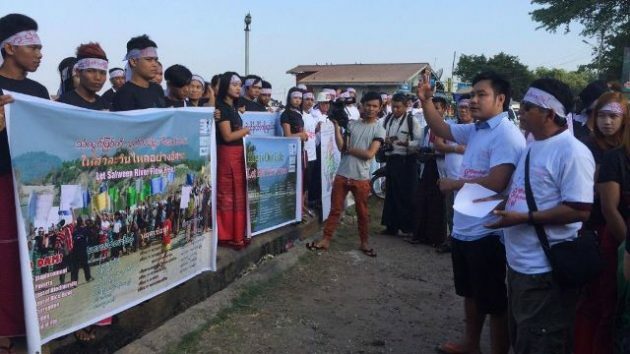 Similar rallies were staged across Kachin, Shan, Karen and Karrenni states, according to a statement from the Burma Rivers Network, the Save the Salween Network and the Burma Environment Working Group. By 2030, the statement says, Myanmar intends to choke the country’s two main arteries with 50 hydropower projects, drastically increasing production rates from the current level of 3,000 to 46,000 megawatts. The majority of the electricity generated would be exported, however, and the proposed dams would be situated in the midst of conflict-affected regions, fuelling concerns over who should have the authority over the use and allocations of the waterways. “All the large dam projects are slated for conflict zones,” said Sai Khurng Seang, a member of Burma Environmental Working Group (BEWG). He added that while the government has already conducted environmental and social impact assessments in target areas, the evaluations may have been skewed by the fact that a number of the residents displaced by conflict. Such estimates could result in under-calculating the number of villagers affected by the project, or who deserve compensation, he said. “That is why we are urging the government to suspend the projects until the peace talks are finished and a federal [system] is achieved,” he said. Protest organizers said that without a federal system in place, ethnic people may feel that they have not been given the right to have a say in what happens to their resources, which could in turn catalyze further conflict. [S]he added that Nay Pyi Taw’s support for such dam projects has raised further doubts about the government’s professed commitment to securing peace. “What is the point of the dialogue process if the central government has already sold off all our natural resources?” said Mi Ah Chai. The three organizing groups called for an immediate moratorium on large-scale dam projects.